Over the past few years, trail cameras have become an extremely important tool for big game hunters all over the world, especially for deer hunters in the United States. However, like any tool, they must be used properly in order to realize their full potential. There are a number of pretty common mistakes that most hunters make when first using trail cameras. Luckily, correcting most of those mistakes is relatively easy, and doing so can significantly improve the quality of scouting that their trail camera can provide. Today, I'll share some tips for using a trail camera that I've learned the hard way over the years. Since they are a valuable item that is left unaccompanied out in the woods, an unsecured trail camera can be an enticing target for a thief. This is especially true when using them on public land. There are three ways to secure your trail camera: by physically locking it to a tree or other mounting device, by placing it in an inconspicuous location where it is less likely to be noticed or stolen, and by registering the camera with the manufacturer and using a security code for operation. Using some sort of device, like a cable lock, to secure a trail camera is an obvious way to secure your camera from a casual thief. However, it is not foolproof: a determined thief can cut the cable or even cut down the tree to steal the camera (I had this happen to me several years ago). Even if he cannot physically steal the trail camera, an unscrupulous person can still take your memory card or destroy the camera. A more effective way of securing your trail camera is to locate it in a place where few people are likely to see it. After all, if a thief doesn't know that the camera is there, he can't steal it. This means placing the camera in a location far away from roads or other areas through which lots of people move. 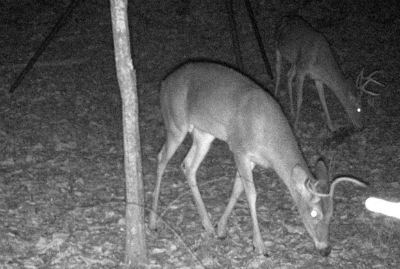 This has the added benefit of increasing the odds of getting useful photos from your trail camera because, generally speaking, locations with lower amounts of human activity have more animal activity, especially of mature bucks. If you get lots of photos like this, your camera is in a high-traffic location where it is likely to get stolen. Finally, some trail cameras have a feature requiring a security code to operate it. Now this won't necessarily prevent a thief from stealing your trail camera, but if you have the password feature enabled, this can potentially prevent a thief from using your camera in the event that he does steal it. Registering your trail camera with the manufacturer after purchasing it can assist in recovery of a stolen camera because the manufacturer will send the camera back to the registered owner if the thief sends it back to the factory to get the password reset. A major mistake that many hunters make is not taking precautions to avoid spooking animals while placing or checking a trail camera and end up scaring the very animals of which they are trying to get photos. Every time you enter the woods, no matter how careful you are, you create a disturbance that can disrupt the behavior of animals by the noise you make and the scent you leave. As time passes after you leave the woods, the evidence of your presence slowly dissipates and animals start to behave normally again. When placing or checking on a trail camera, it is important do all of the things you usually do when hunting to avoid alerting animals in your vicinity to your presence. This includes things like staying downwind of likely deer locations, wearing rubber boots, using a cover scent or scent-eliminating spray, not slamming your car door, etc. Don't forget to take the same precautions with the trail camera. After I’m finished handling the camera, I like to spray it down with a scent-eliminating spray (just be careful not to get any on the camera lens). Another trap many hunters fall into is the temptation to check their camera for new photos too frequently. Checking the camera more often means more disruption of the animal routines in the area and therefore less chances of seeing a trophy animal. There are two ways to avoid this: by checking the trail camera no more frequently than once every 7-14 days, or by purchasing a wireless trail camera that can send photos to your cellphone in the form of text messages. Of these two, the wireless trail camera is the least intrusive, but is much more expensive and will only work if there is cellphone service in the area where the trail camera is set up. Proper positioning of a trail camera is probably the single most important factor in getting good photos. One commonly-overlooked aspect of orienting a trail camera is the location of the sun relative to the subject of the photograph. For locations in the northern hemisphere, the trail camera should ideally face north. This will ensure that the sun is behind the camera, and help reduce the number of false triggers or "washed out" photos where no details are visible. If it is not possible to point the camera to the north, then face it south. Facing the camera directly west or east is least desired, as this will ensure that the camera is looking directly at the sun as it rises or sets. 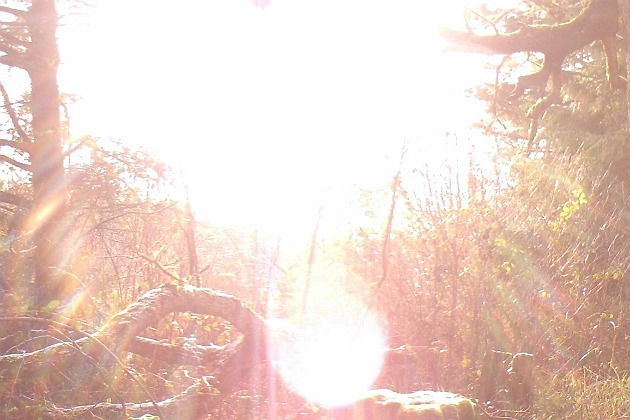 This is why you don't want your camera to face directly into the sun. 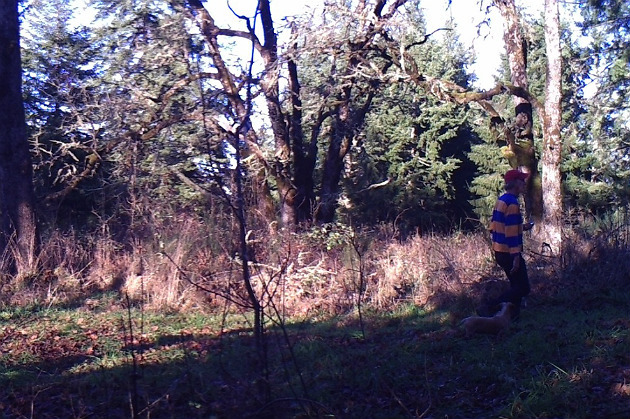 Additionally, when placing a trail camera, trim branches and leaves around the camera. This will ensure that their movement will not accidentally trigger the camera when game is not present. Trimming branches around the camera will also ensure that the photographs are free from obstructions and better allow for easier identification of game in the photographs. There is a deer in the photo, but the branches make it very difficult to identify. At the same time, ensure that the camera is positioned at an appropriate height. I've found that 2-3 feet off the ground works well. A camera placed any higher than that, must have enough of a downward angle to avoid missing game completely. Remember, most animals aren't tall and can walk right by a camera without triggering it if the motion sensor is looking over the top of their head. 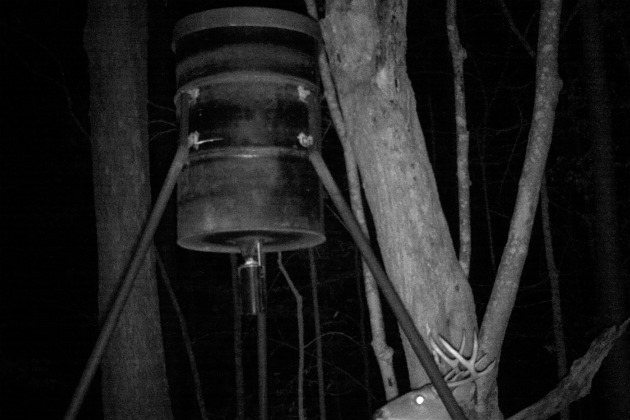 There is no telling how many deer visited the feeder but didn't trigger the camera because it was too high. 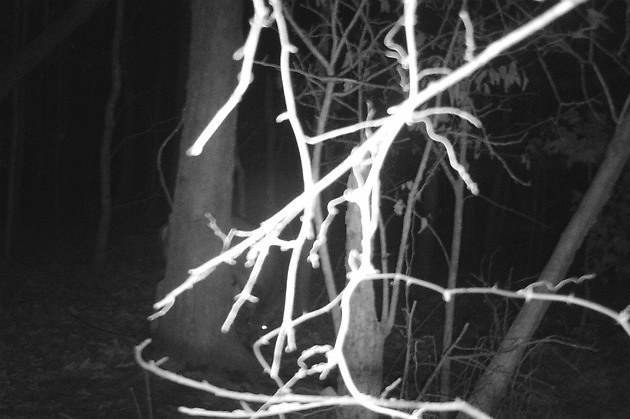 A trail camera can be a powerful scouting tool if used correctly. If used improperly, it can actually do more harm than good. Keep these points in mind next time you use your trail camera. Hopefully, you will not have to learn some of these lessons the hard way like I did.